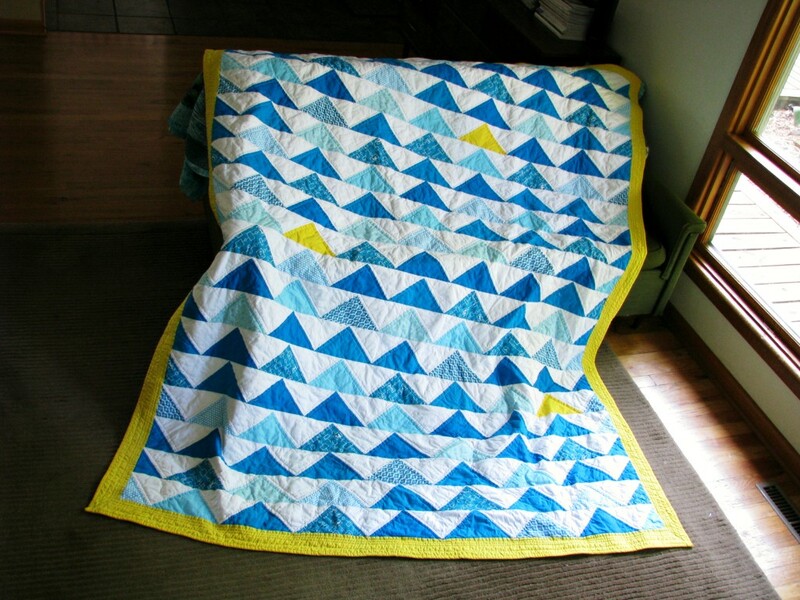 This is the Flock of Triangles quilt from “Denyse Schmidt Quilts.” It is also traditionally known as a flying geese quilt. I made this in a larger size than the one in the Denyse Schmidt book, so that required some math, which I apparently didn’t do correctly because the quilt was smaller than I had intended. Hence the yellow border. But I actually like the border quite a lot. This ended up somewhere between a twin and a full, but it will probably live on twin beds for most of its functional life, so that works. This was my first try with a walking foot. I know I should have practiced on a pillow or something, but I just wanted to get this done, so I forged ahead. It is so not perfect in any way, shape or form. 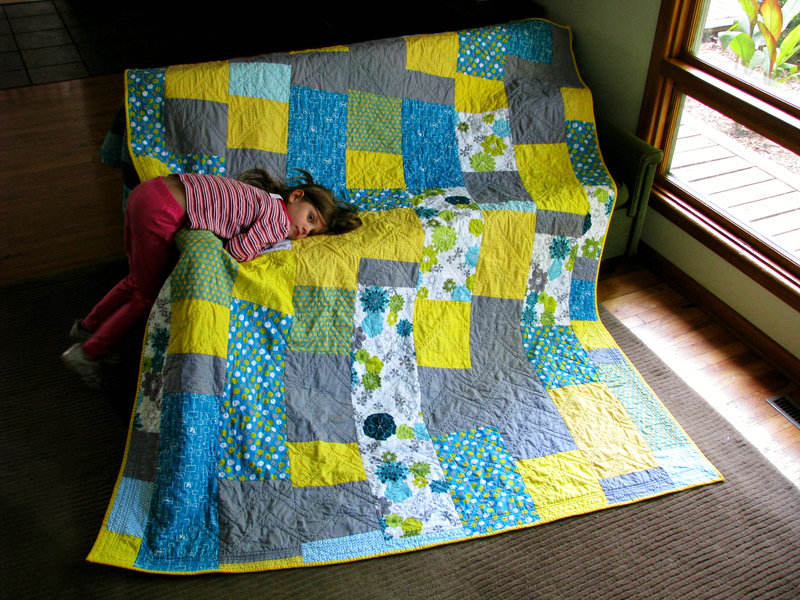 I quilted in a chevron pattern, which involved a lot of struggles with the quilt in my little machine, twisting and turning. I broke numerous needles. My tension kept getting messed up. It was not pretty. But it’s done. For the back, I just made one long string of patchwork and cut it into rows. Charlotte prefers the back to the front. She’s crazy. But, hey, it’s her quilt. She’s been waiting so long for this. She is so happy every night when I tuck her into bed with this quilt. It makes me happy, too. Thanks! It is 76-ish by 88-ish. Something like that. I can’t remember exactly. 🙂 Between twin and full. Thank you, Beki! It’s a fun pattern.